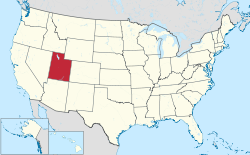 The following is a list of prominent people who were born in the U.S. state of Utah, live in Utah, or for whom Utah is a significant part of their identity. 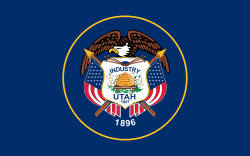 Harvey Fletcher – physicist, invented the hearing aid and audiometer; called "the father of stereophonic sound"
John Willard Marriott – founder of worldwide hotel business Marriott International, Inc.
John Warnock – co-founder of Adobe Systems Inc.
^ a b c d e f "The 10 Utahns Who Most Influenced Our State in the 20th Century". historytogo.utah.gov. ^ a b c d e "Runners-up for the Most Influential Utahns of the 20th Century". historytogo.utah.gov. ^ "A mentalist bends a fork with his mind & guesses the name of Brooke's first kiss!". fox13now.com. December 1, 2016. ^ Sorensen, Mike (May 17, 2010). "A Grand Adventure". Deseret News. Retrieved July 16, 2011.